Every Fall I like to display a big elk antler that we dragged home from the in-laws elk ranch...yes they used to ranch these elk when there was a market for their antlers in Asia. Supposedly there are some medicinal properties in the antlers when they are in the velvet. If you didn't know this already, elk naturally shed their antlers every single year and grow new ones. Anyway the in-laws ranch is stocked with more antlers than one knows what to do with. 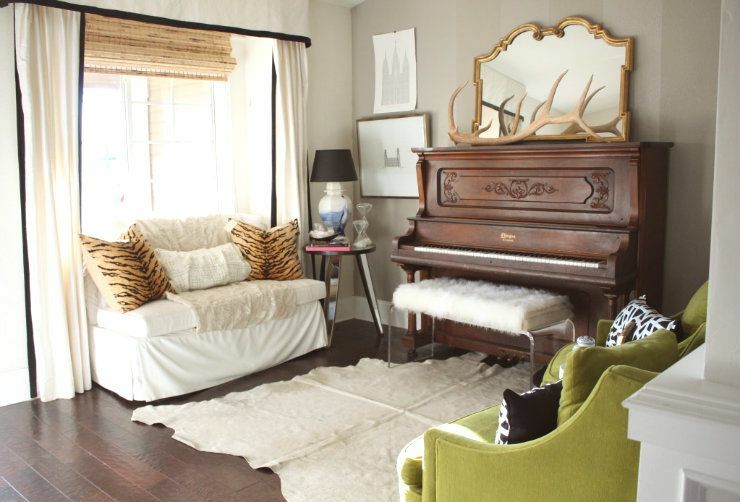 As I placed the large antler upon the piano I was pondering my home. I was thinking such things as "does my home represent my design aesthetic or how much am I influenced by what I see online or in magazines but don't really love the look?" I started feeling bad because when I looked around it wasn't exactly how I wanted it to look...AND then I thought "bad Christina". I do not want to ever fall victim of not being grateful for what I have or feeling like things have to be a certain perfect. Every time I think I have mastered the concept of replacing gratitude for negative thoughts or feelings, I really haven't completely. I'm afraid it will always be something I will have to work on. I feel like I am much better at it in my more experienced life but still....Besides I should feel happy that I have worked over my home on one of the tightest budgets and that is something to mention. In fact my husband should thank me profusely. 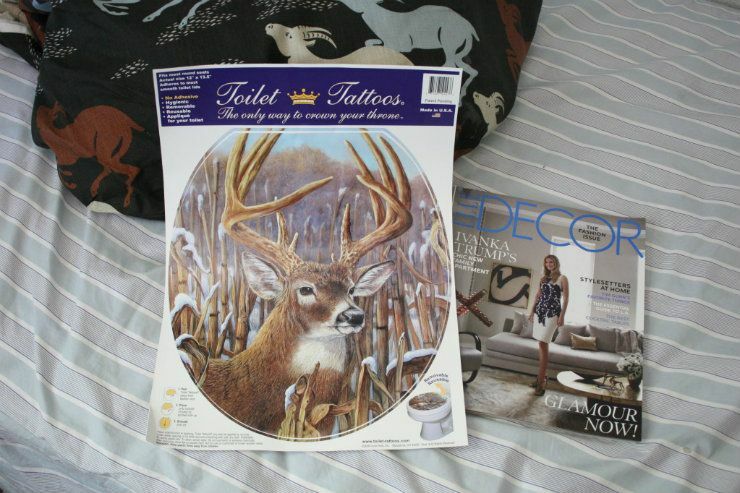 Speaking of mentionables and husband and a budget I may also need to discuss the time I decided to buy a toilet tattoo. Have you seen 'em? Seriously why would one ever put one up on the check out stand right next to the latest Elle Decor and feel good about it. Oh I had big plans I tell you. I snuck that thing into the home, placed it on husbands toilet (which happens to be mine as well) and waited. I only wish I could have seen his face when he went to use the restroom that fine evening. I didn't hear him laugh and he didn't give me any kind of reaction but I am convinced that he must have been amused on the inside..he just had to have been. I finally couldn't handle it anymore so I said to him, "did you um like the new toilet tattoo..I was thinking about you and your love for nature". Always thinking of him and not me. P.S. - My home is looking a little too traditional. Time to mix it up. P.S.S - If you are thinking of a toilet tattoo I must mention that it is best to have one of them small kind of toilets. I'd love to know where you found a cowhide that is actually white, unlike what some advertise to be white and are actually tan. And a perfect size! And yes it is actually a pretty white color and has held up very well with kids. I just shake it out every once in a while. You should be completely satified with your home exactly as is - now that you are the owner of a toilet tattoo. I love your title....and those antlers are awesome. Oh and by the way. I am off to secretly find some toilet tattoos in Australia. I love them! Wow, this is your house? It's beautiful! I was wondering which magazine this was out of when I first clicked over. 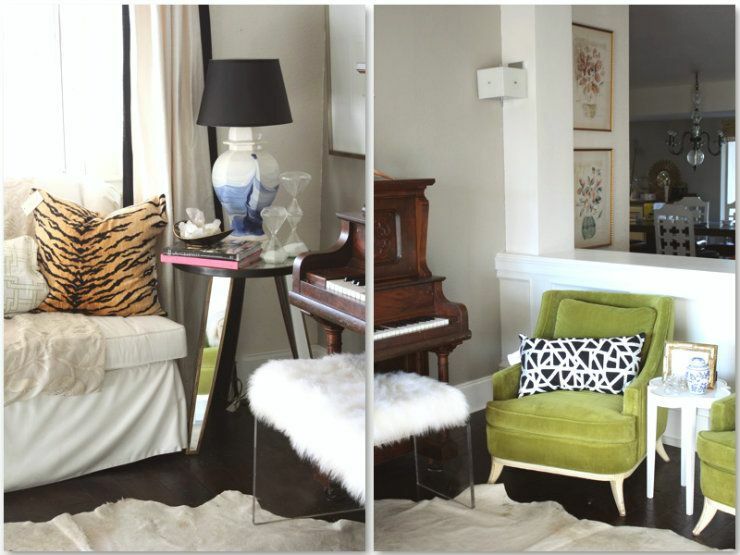 I have to say though, that cow hide rug looked like a cut out drop cloth to me, which actually sparked an idea since I am vegetarian and don't like hide/fur as decor or clothing. I don't think it looks bad (considering I thought it was burlap), I just thought how fun it would be to make my own, inexpensively and humanely, using drop cloth or similar canvas type material. Hey Eva and thank you..the chairs are vintage with the original vintage fabric. I found them while thrifting. Tawnya - I painted that wall about 7 years ago and am having a hard time remember what color I used. It was a Ralph Lauren paint..pewter or titanium or something along those lines. I'm sorry I couldn't be of more help. I know what you mean... it's hard to not get trapped in feeling like what we have isn't enough! I guess we just have to keep trying to focus on the good! Way-low! He better have laughed. That's funny stuff, I don't care who ya're! good lord in heaven where did you get those pillows?!!? are the le tigre/scalamandre!?! ?